The clinical benefits of the Imorgon Ultrasound Enhancement System™ result from advanced software that fully integrates with your existing enterprise workstations and PACS. 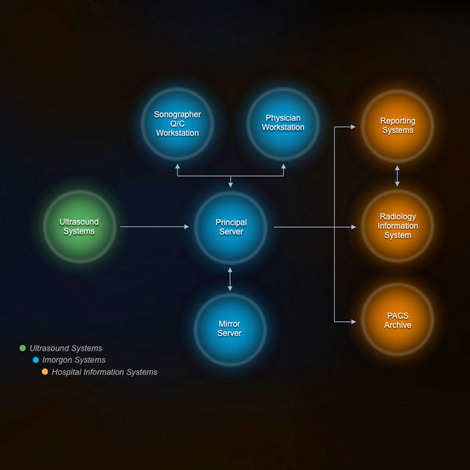 In addition, the system’s harmonization engine provides vendor-neutral compatibility with the ultrasound systems and dictation systems you’re already using. While enhancing your PACS’ ultrasound capabilities, the Imorgon System works invisibly, in strict compliance with HL7 and DICOM standards. It interfaces with any ultrasound system capable of sending DICOM Structured Report (SR) data and is fully functional within complex, technically diverse HIS and RIS environments. Reports are consistent no matter which ultrasound system is used to perform a study. Translates data from the ultrasound system and transfers it into the voice recognition/dictation system templates, eliminating dictation of numeric data. Auto-populates report templates with measurements, calculations and observations. Eliminates dictation of bone density (DEXA) values with auto-calculated, whole body minimums that are imported directly into the report. Can automatically add sonographer findings to reports, further reducing dictation time. Imorgon Customer Support is there to provide the help you need around-the-clock, including proactively monitoring your system’s “heartbeat” 24 x 7. To help ensure high data availability and security, Imorgon maintains dual, fully redundant servers. System updates are free with your service contract, regardless of the number of workstations you have.